Open every Saturday from 10am to 4pm. or call 800 252 1476 for appointment. Martin Sheffield, an avid clock enthusiast for over 35 years has brought a world class antique clock business to the heart of Muskoka. Muskoka Time and Clock Museum is located right in The Clock Tower Centre at the corner of Manitoba and Taylor, in the heart of Bracebridge at 49 Manitobe St. known as The Clock Tower Centre. The Clock Tower Centre's three floors are filled with historic antique clocks from the United States, Canada, Britain, Germany, France and Japan. Each clock is numbered with a complete description of the clock in the Museum Manual. Suite LL2 is the main Muskoka Time store and features numerous American, Bristish, Canadian and French antique clocks for sale. All clocks are for sale at the Muskoka Time and Clock Museum. The Clock Tower Centre is in itself a destination point for tourists. The main floor has a Galleria Mall featuring jewellery artists, a famous Canadian inspirational artist, as well as other famous local artists. The main mezzanine floor of The Clock Tower Centre has an amazing Juice Bar called Jar Bar Juice Bar where you can sit down and enjoy healthy wholesome salads and smoothies. The Lower Level features a cafe' "Tickers and Chimes" where you can make your own coffee and sit down to hear the simultaneous ticking and chiming of more than a 100 antique clocks at the same time. This is an experience that no other coffee shop in the world can offer you. Muskoka Time offers a professional repair service for your antique clocks and watches. Please bring them in to Muskoka Time and Museum Suite LL2 open every Saturday from 10 to 4pm. Please call ahead 800 252 1476 to confirm that the store and museum will be open on the Saturday that you plan on coming. All clocks are for sale at the Muskoka Time and Clock Museum at very reasonable prices. Three floors of amazing antique clocks are on display and are on sale plus one room on the Lower Level that is home to over a hundred antique mantle clocks from Canada, the US and France. The famous Arthur Pequegnot clocks are on display at Muskoka Time and Clock Museum. 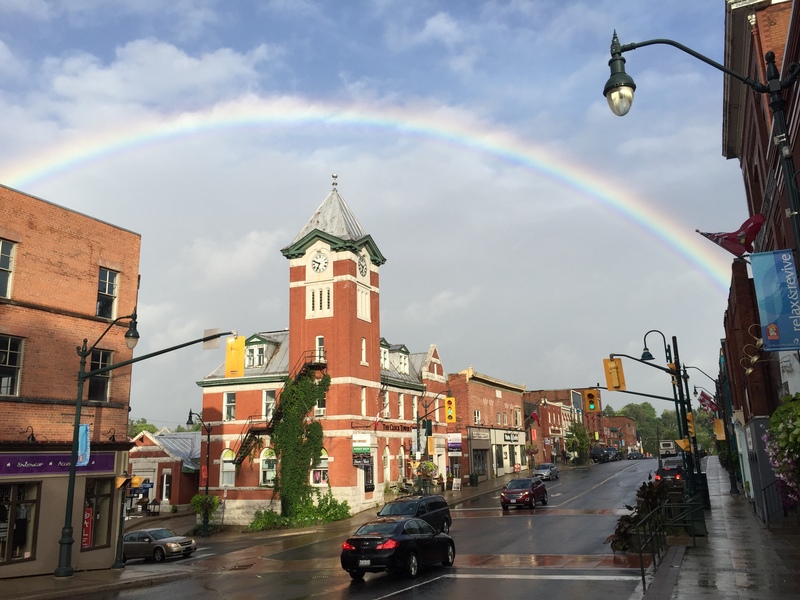 Muskoka Clock and Time Museum is located in the same building that houses the massive Tower Clock that is time for the Town of Bracebridge. This immense Tower Clock forms part of The Muskoka Time and Clock Museum. Looking forward to seeing you there on Saturdays. Bring your antique clocks and watches that need repair. Tour the 3 storey museum and learn so much about the history of clocks. Enjoy having coffee in the Tickers and Chimes Cafe. This is a once in a life time experience you'll always remember. Perhaps you may buy an antique clock to enhance the decor of your cottage or home. There's nothing in the world as peaceful and calming as hearing the gentle sturdy reliable tick of an antique clock in your Muskoka cottage or home. Remember to call 800 252 1476 ahead of time to confirm that Muskoka Time and Museum will be open before you come.